As per Google, Hangout is the future for Google audio and video communication tool and that was why Google decided to discontinue Gtalk. It is the most logical thing that Google can do now replacing with Hangout. It has also decided to cut support regarding security and version for the desktop application. As posted by Google the IM service will be wholly replaced by the Hangouts app, which can used only via its Chrome web browser. Gtalk will be shutting down on February 16. Gtalk will become history like Orkut. Hangout hasn't been openly liked by all users as compared to Gtalk which was widely accepted by millions of users. Hangout has been integrated with phone-tablet-PC like something Microsoft has tried with Windows 10. Anyway the transition was bound to happen since last year. Popular messaging app WhatsApp has now moved to PCs as well and that has made Gtalk all the more redundant, so with Hangout Google wants to make instant messaging which will be interactive and a visual approach. Send photos or emoji, see when people are engaged in the Hangout and message friends anytime, even if they're not connected right now. Turn any Hangout into a live video call with up to 10 friends or simply search for a contact to start a voice call from your computer. 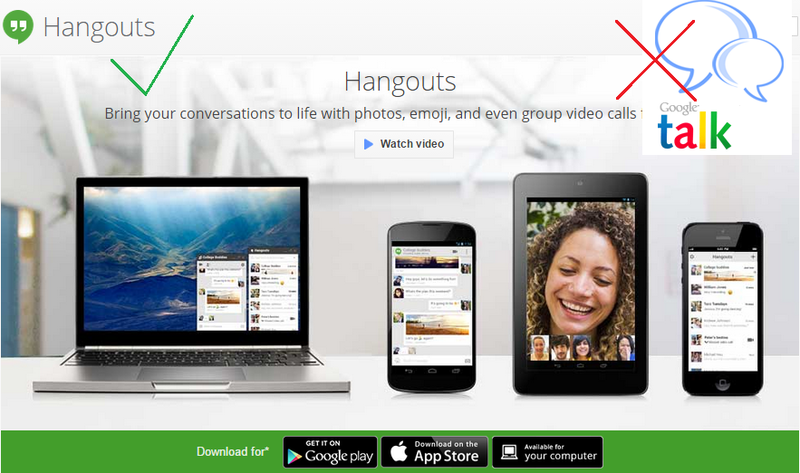 Hangouts works on computers, Android and Apple devices, so you can connect with everyone, and no one gets left out. Lets see how Hangout replaces its predator's place in terms of popularity.